Warranty Information. Keyless blade change. 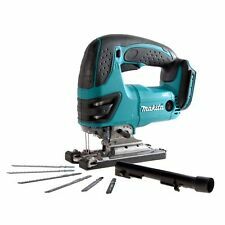 Makita JV183DZ 18v Cordless G-Series Jigsaw – Bare Unit Stock Code: JV183DZ The G-series range from Makita is a different lithium-ion battery platform to the Makita LXT range of professional cordless power tools, and is powered exclusively by the G-Series battery and DC18WA charger. Produced to a quality far exceeding that of DIY products, the G-series range offers a comprehensive catalogue of tools at an attractive market price. The G-Series battery is identifiable by the white or grey top section, and offers a 1.3 amp hour battery capacity in both 14.4v and 18v platforms. A 60-minute charge time is achieved with the G-Series DC18WA battery charger. *G-Series batteries are not compatible with the Makita LXT range of cordless tools or chargers. Compatible with: DF457D, HP457D,. The Makita JV183DZ is a quality compact and lightweight 18v Li-ion cordless jigsaw poweredexclusivel y by the Makita G-Series Li-ion battery system (not included). Other handy features of the Makita JV183DZ jigsaw are an electric break designed to prevent accidents in the workplace, on the front of the jigsaw there is a clear plastic guard that can be slid down to protect the user from dust & splinters it can be connected to a dust extractor as well resulting in very clean dust free cutting operations. The Einhell TE-JS 18LI Power X-Change Cordless Jigsaw is a powerful tool for diverse sawing jobs. The selectable pendulum action and smooth operation enable fast and precise cuts. 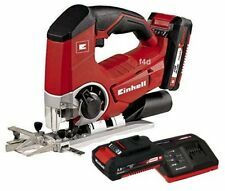 1 x Einhell EINTEPL850 18v Li-Ion Cordless Jigsaw. Other features of the DJV180Z are variable speed trigger, a high comfort grip for user comfort & a dust extraction nozzle. • 6 x Jigsaw Blades. • Large 2 finger variable speed trigger. • Body only machine: 1. Battery: 20 V Li-Ion (2Ah). Connection to external dust extraction - includes an adaptor. Blower function to ensure a dust-free cutting line. Safety switch. Integrated LED work light. 2 x Mixed Bosch blades NEW. Used but fully working ! See photos! 1 x 2.4 Ah Original Battery. Bayonet (Universal) Shank Jigsaw Blade. Rigid aluminium base bevels 0 to 45° left and right. Bosch GST 10,8 V-Li Cordless Jigsaw Bare tool - Used. Excellent condition - hardly used - BARE UNIT ONLY, NO BATTERIES OR CHARGER. Part number: 0603011002. EAN code: 3165140577175. Both can be used with all tools in the Bosch 18 volt system. One battery fits all – suitable for all DIY and garden tools in the Power4All lithium-ion cordless systems. Dewalt DCS331N Cordless Jigsaw NEW. - Battery Capacity: 18v XR Slide type Li-ion. - Latest generation premium Jigsaw featuring new XR Lithium Ion Technology. - Powerful & Highly efficient DEWALT PM47 fan-cooled motor with replaceable brushes. 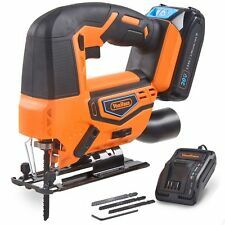 DCS331 XR 18VOLT JIGSAW BARE UNIT includes dust spout. Latest generation premium Jigsaw featuring new XR Lithium Ion Technology. Quick and easy patented keyless blade change system, accepts T-shank blades. AEG Cordless Jigsaw 18V BST18X-0 . Condition is Used with battery. No charger! Dispatched with Royal Mail 2nd Class. Makita DJV180Z 18V Cordless LXT Jigsaw NAKED. RYOBI ONE 18V CORDLESS JIGSAW - CJSP-180QEO for One Plus Batteries . Condition is Used. Dispatched with Royal Mail 2nd Class. DeWalt DCS331N 18v XR Li-Ion Jigsaw Bare Unit. 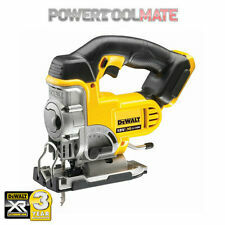 DeWalt 18V XR Li-Ion Jigsaw - Bare Unit - DCS331N. 1 x Dewalt DCS331N Jigsaw Bare Unit. Battery Chemistry: XR Li-Ion. Tool-free adjustable shoe with anti-scratch cover bevels 45 degrees in both directions. 1 x DCS331N Body Only. Powerful & Highly efficient Dewalt PM47 fan-cooled motor with replaceable brushes. Battery chemistry: XR Li-Ion. No Load Stroke Rate: 0-3000 spm. Stroke Length: 26 mm. 1 x T-Stak Case (Tote Tray Not Included)Product Specifications. SOLD BY AN AUTHORISED UK MILWAUKEE DEALER. Milwaukee® patented FIXTEC blade clamp for fast and easy blade change. Flexible battery system: works with all Milwaukee® M18™ batteries. - The Einhell TE-JS 18LI Power X-Change Cordless Jigsaw is supplied as a Bare Unit, No Battery or Charger - The Einhell TE-JS 18LI Power X-Change Cordless Jigsaw is a powerful tool for diverse sawing jobs - The selectable pendulum action, with 4 settings, and smooth operation enable fast and precise cuts - The universal blade holder without tools saves valuable time, while the integrated plastic sliding element protects sensitive work pieces - Includes a dust blow-off function for optimum visibility, LED light to illuminate the cutting area and an additional attachable cutting line guide for exact cutting - It is a member of the Power X-Change family and is powered by lithium ion rechargeable batteries with a battery management system for a long life - TE-JS 18 Li Kit: 1 x.
Parkside 20V Cordless Jigsaw. Adaptor for external dust extraction. Blower function ensures a dust-free cutting line. Rated no-load rotation speed: 0–2,700rpm. Bevel cut left/right: 0°/15°/30°/45°. DeWalt DCS331 XR Jigsaw 18 Volt - Bare Unit with Tstak Case Stock Code: DCS331N-TSTAK Features of the DeWalt XR Jigsaw: Latest generation premium Jigsaw featuring new XR Lithium Ion Technology. Part of the intelligent XR Lithium Ion Series designed for efficiency and making applications faster. Powerful Highly efficient DEWALT PM47 fan-cooled motor with replaceable brushes. Delivers fast cutting action up to 3000 strokes per minute maximising user productivity. Intelligent variable speed trigger lock-off switch for quick controlled cuts and enhanced work safety. Tool-free adjustable shoe with anti-scratch cover bevels 45 degrees in both directions. Quick and easy patented keyless blade change system, accepts T-shank blades. Patented anti-vibration counter-balance mechanism.